Milo has taken to climbing anything and everything recently and his favorite thing to climb up on is his window seat. 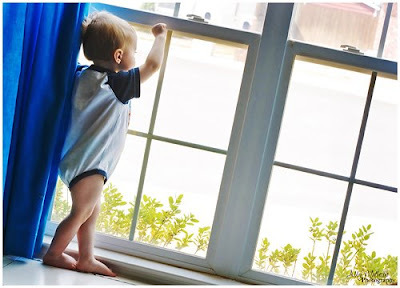 He loves to climb up there around the time Chris is supposed to come home and look out the window waiting for daddy to pull into the drive way. It's so sweet how much he loves his daddy! That would make any daddy smile! So sweet! Love the photo!! I so wish you were close enough that I could hire you to take pictures for us....LOVE YOUR PICTURES!!! Milo was Bitten by a Donkey... Yes, a Donkey.